I am old. I will be 45 in September. I don’t really feel old, and I don’t think I look old, but I have long suspected that I must be old. Cashiers sell me booze without blinking, and everyone calls me ma’am. But any doubt that I was aging died a few weeks ago, when my baby boy had to go to the Emergency Room. When they brought in his discharge papers to sign, they handed the clipboard to HIM. Not to me, his mommy, but to HIM! Lady, I don’t care if he does have five o’clock shadow and a voice like Al Green—you best hand me those papers! Screw HIPPA! And then, proud parent moment, he actually read them before signing. In my head, he is still the cherub faced little rug rat playing with Hot Wheels, and watching continuous loop footage of The Lion King. How is he driving a lifted pick-up truck? Why is he taking Business Calculus, instead of learning his ABC’s? Why is that little girl in the lake with him wearing a string bikini instead of a ruffled tutu bathing suit? Where are their floaties? Why is he going to work this morning? I’ll tell you why! I don’t remember it happening. It just happened. Only yesterday my husband and I were chasing toddlers, and then we woke up and we have these two pre-men in our house. They are growing hair everywhere—EVERYWHERE—and they don’t smell like baby powder and chicken nuggets anymore. So if that happened to them, something has to have happened to me, right? A precursory look in the mirror, reveals—nothing. I am pretty sure I look the same as I did in college. It’s just that the college kids today look like they are in fifth grade, right? Right? Shut up! Who asked you?! So upon closer inspection, I see—no gray hair—that’s good. Okay, so I see some very fine lines between my eyebrows, where I frown at the computer. It must be creases in my make-up, so I remove my make-up. Wait…Why are the lines still there? And when I put my eyeliner on, and add the little tail at the end, why does the tail seem to droop? I’ll tell you why! Because my son signed his own paperwork at the Hospital. Because he is taking Business Calculus. Because he is driving a lifted pick-up truck to work every day. And because the girl riding shotgun is not in a booster seat, and she is not wearing a ruffled tutu bathing suit. But I don’t feel old. I think my children have grown up around me, and I am still 25. The day that I look in the mirror and think I look my age will be the same day I make an appointment for Botox injections between my eyes. If my hair gets gray, no problem—L’Oreal has a solution! I will not, as the commercials say, grow old gracefully. I will fight it every step of the way. Until I need to ring up Doctor 90210, I only need periodic rejuvenation of my mind and soul. Two things that take me back so quickly, and so perfectly to my childhood, are my sense of smell, and my taste buds. And when my nose smells something cooking that I enjoyed as a child, it is a double WHAMMY, guaranteed to bring me warm and fuzzy feelings. Like I am a little girl in a ruffled tutu bathing suit, eating lunch my granny prepared. Below, I am sharing one of my favorite comfort foods from my childhood. Porcupine balls. No, no! This isn’t a “rocky mountain oyster” sort of thing. 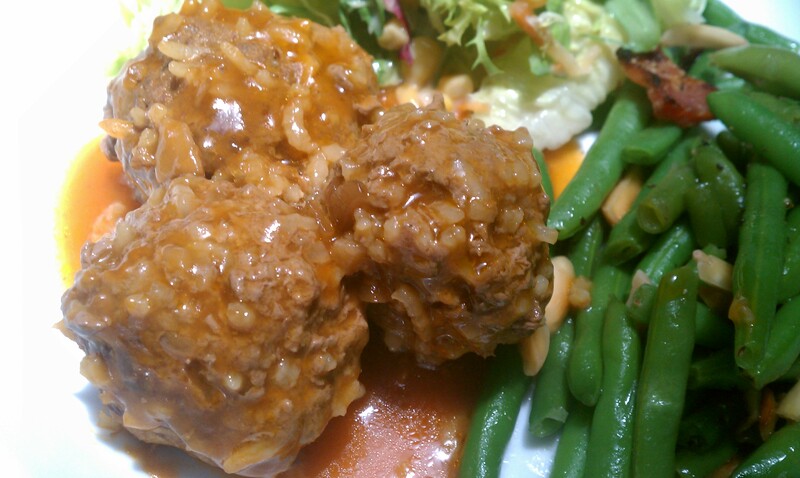 Porcupine balls are ground beef mixed with rice, formed into balls, and pan-fried and simmered in gravy. A few weeks ago, one of my friends, Adam over at Unorthodox Epicure, mentioned he had made them for dinner. I had never heard anyone else ever mention them before, so I was so excited to share memories about them with someone. We decided we would both write about them, and share both of our recipes with you….We did not discuss ahead of time how we would approach our stories, so it was kind of funny to see how similar they were. Obviously, porcupine balls illicit in both of us memories of our youth, and strong feelings around the passing of time….Stick around and read his story and recipe below, and then go visit him at Unorthodox Epicure….He makes hilarious observations, and has some really great recipes! Combine meatball ingredients in a large bowl. Roll into 2” balls. Fry in a large skillet until browned on all sides. Mix soups and water together in a large bowl, and pour over meatballs. Cover, reduce heat, and simmer for 30 minutes. You have your meat and starch covered….Just serve with a salad or other vegetable! Confession 52 – Good advice from my mother in-law: Stop wishing your life away. It has finally occurred to me that time is unwavering. It’s also deceptive, unsympathetic … unforgiving. I’ve always rushed the time to arrive at the next moment. And, though I can recall many of those happenings, my rear-view mirror is beginning to blur. This past week I drove past the now-overgrown field on which I played T-ball for the Reds. Though we had a few thriller games with the eventual champions, third-place teams in those days didn’t receive trophies. That patch of grass seems much smaller now and I cannot remember the names of any teammates. Just east of that field sat my old elementary school. It doesn’t seem that long ago that Dad and Grandad pulled up to the Garfield Street entrance of that school in our family’s 1960 Ford station wagon. Their elbows rested just out the windows, as it was late May. I can still hear Grandad saying ‘Hi Smiley,’ as I approached the car after the final bell of my kindergarten year. I’ll always remember my first glance at the brand new blue Schwinn bicycle resting in the large space behind the back seats. It was an early birthday present. I can still smell the burning oak and pine at George W. Pirtle Scout Reservation as I tromped back to my campsite, where my scoutmaster, Joe Smitherman, had the cracker barrel ready and waiting. In my eyes, he never aged. But I told a packed sanctuary many seemingly-fresh stories about our troop’s adventures at his funeral more than two years ago. My son enjoyed many moments at the same camp, in most of the same campsites. He ate in the same mess hall and took his swimming test in the same pool. He moved on from Scouting a few years earlier than I did, but not before creating some memories. As his assistant scoutmaster, I created a few new ones. And I was blessed with the opportunity to also go back in time. A couple of weeks ago, I saw a circa 1974 photo of my MaMaw — Dad’s mom — sitting on a porch swing, flanked by my younger sister, older brother and me. I don’t remember that afternoon in Paris, Texas and I doubt my children remember sitting similarly in a large chair near the fireplace — my son on the lap of his older sister. He was two and she 10. They hammed it up for the family members who’d watch this video of our Christmas morning. Their 12-week-old little sister sat with them, staring ahead and sucking her thumb. Thankfully, we have proof that those events occurred. I might have eventually needed proof of my time at Judson Middle School had I not visited those old stomping grounds just prior to its demolition a couple of years ago. The field house looked and smelled just as it did in the early 1980s, when I wore the pads and helmet of the city’s worst team. Neither the school’s logo nor the head coach have changed, but the campus is now modern. Our youngest child — the same one who sucked her thumb for the camera on Christmas morning in 1998 — is entering her final year at my alma mater and it just seems too soon. As a child wishing for the end of school or for Christmas morning, my wife still remembers her mother warning her to stop wishing her life away. Lillian, by then, had it all figured out. Catherine, like the rest of us at that age, felt immortal. Will Christopher remember all of those times I played catch with him? Will Alexandra remember putting on an oversized apron and helping me cook? Will either of them remember their mother volunteering countless hours for every organization in which they were involved? Or making them pose for the camera when they preferred not to? When I was 16, my dad was so responsible. Mature. Grounded. Now that I’m the father of a 16-year-old son, I don’t see myself like I remember seeing my father. How does my son see me? Time will hopefully tell a good story. But, I’d prefer not to rush it. Like what you’ve read here? Please come join me for the daily conversation on Facebook by liking my page. No matter how skewed my memory, a plateful of porcupine meatballs always takes me back. They are simple — not only to make, but also in-depth of flavor and consistency. They are also cheap, which is probably why porcupine meatballs were a fixture on the menus of my childhood. I still like to drench mine in Worcestershire sauce, but those opportunities don’t come nearly as often as they used to. It seems I’m not the only one who turns to porcupine meatballs when I’m waxing nostalgic. I learned recently that my good friend Christine, of Texana’s Kitchen, has her own version of this comfort food. If you don’t know Christine, she’s cool like a Quentin Tarantino flick. And her food? Well, let’s just say that Bobby Flay likes it. Mix beef, rice mix, rice, eggs and spices in large bowl. Roll into 2-inch balls and brown on all sides in a large (deep) skillet in oil. Remove meatballs as they are browned and set aside. Once all meatballs are browned, add flour to remaining oil and stir constantly for about two minutes. Add broth and mix well. Add meatballs back to skillet. If necessary, add water so that liquid covers meatballs. Bring to boil, then reduce heat to medium-low. Cover and cook for about 45 minutes, stirring occasionally. Serve with egg noodles and (canned) peas if you want to eat it like I did growing up. Otherwise, the rice and vermicelli in the meat gives you more than enough starch to eat it with a side of vegetables. This makes enough meatballs for 6-7 people, or one really hungry person who wants leftovers 3-4 times. I’m with you! My son has gotten taller than me this year, and his voice is DEEP. So deep my husband can’t figure out who’s on the phone, and the chiropractor makes fun of him every time we visit. He’ll be driving in Sept. My daughter is leaving in a few weeks to be a college senior (what?? )… Long gone are the little tutu bathing suit days! aha! you are right there with me! Oh my gosh! This used to be MY comfort food when I was a little girl, and I haven’t found a recipe for it in decades. Thank you Thank you!! Oh, and no, you are NOT old, you’re just a young mom of a boy who somehow grew up….Great post. Make them! I hadn’t had them in YEARS, and they were SOOOOOO good! Okay, great recipe, easy to follow, and turned out great. The rice was still a little undercooked. Do you have that problem? Otherwise, deeelicious. Yes, that makes sense. I think I used less water! Awesome! Glad you’re tactic saved me from aging! That was a beautiful post.And the recipe you had is so spot on to my comfort food from 50 years ago.As for the age thing;I have a 16 year old grand-daughter so I’m way beyond the “I’m not old” dodge.What a great blog. Thanks….luckily, old is really a state of mind, at least I hope, because then I’ll likely never age. I refuse to grow up–it’s a trap! My mom always simmered hers in tomato sauce. An odd rendition of a meatball. And served with mashed potatoes. I miss hers but I think I’ll give your version a try. By the way, you’re not old until the grandbabies have college degrees. great! then my parents aren’t even old yet! A great read… All about getting older. Check out this blog. Beautifully written and the recipe sounds delicious! I cannot believe my son is two. I can relate. He wants to do things himself most of the time. Really touching post! I had to giggle when I read your line “I’m not going to grow old gracefully I’m going to fight it every step of the way”… lol.. I say this all the time! I will be 41 in a month.. A MONTH.. when the hell did I turn 40 and where did my 20’s and 30’s go? My son is 15 now (my oldest) and he’s taller then me, weighs more then me and most def doesn’t smell like baby powder or chicken nuggets anymore. I guess it happens to the best of us, huh. Yes, we seem to be in good company! cute name…. porcupine def won me over…so dang cute.. Enjoyed the post which I read via a link on Creative Noshing. My oldest got married last weekend and that really hit home with regards to the whole aging chapter of my life! I loved your post and I’m with in the “fight it every step of the way” 😉 Both recipies sounds (and look) delicious. I like yours especially because I don’t know where I can find the Rice & vermicelli mix. Too late about not getting fat, or sun bathing, although I did quit the latter 25 years ago….I quit drinking any sort of alcohol years ago, and have never even taken a puff off of a cigarette. Genetics also play a huge role in how people age, and luckily I have thus far resembled my beloved Granny in most ways. Although she did smoke for most of her life (and died from it), she never really got wrinkles, and her didn’t gray for a very long time. The native american in me will also serve me well in those regards. and you look fabulous, by the way…I would have guessed your age to be at least 25 years less…. I feel the need to reiterate that aging really is in great part a head thing. Plus, even if someone doesn’t have good genes or has had habits that are not conducive to staying young looking, people are always glad to see someone coming who is young thinking, and by that I certainly don’t mean immaturity but rather a lightheartedness. I wish I’d had more of that when I was younger. Oh girlfriend! We are in the same stage of life and fight, I will. Thanks for an affirming post. Yes we do..it’s on like Donkey Kong..
Er – excuse me. Definitely not old! I know a 28 year old who is ancient – was born that way – and a 40 year old who is really ready for a bus pass. I know an 80 year old who is not old. She does keep fit every Tuesday morning and her skin looks like peaches. My son rang me up one day to tell me I had to change my age (28). When I asked him why, he said it was because he had overtaken me. I had to double check to discover he was right. And since he will be 39 this year, I have to tell you that you are but a spring chicken. I refuse to be old. I just won’t do it, dammit. The way I see it, 40 is the new 25, 60 is the new 40. There is no way I would do Botox or any other stuff like that. Just eat fruit and drink lots of water. And smile. That fills up the wrinkles. They only show when you look glum as my passport photo testifies. I look 184 on that. I agree…I decided that if 30 is the new 20, and 40 is the new 30, then really I must be 24, twice removed. Great, pleased to hear it. I know just how you are feeling. I will be 46 in a few months..that’s waaay to close to 50! Love the back stories to the recipes. Keep up the great work. LOVED your story! I shared it on FB for all of my friends and family in the same boat (acceptance that our boys are now “grown ups”). OH, and I’m going to try your recipe for dinner. My mom made these often. I haven’t had porcupine meatballs in years. I think I will print this and make it for dinner this week. I am glad your son is ok and yes, they grow…to fast. I have 2 grown now (I’m 47) and lately have been feeling O-L-D!!!! But thankfully I have a 6 year old that doesn’t allow me to think it for too long. Instead of making sandwiches these days, I often feel it (between adult kids, aging parents, and a little one). I enjoy your posts and recipes! A six year old would kill me! If they could just bottle energy….I am content these days to borrow my young nieces and nephews, and send them home when they’re all sugared up! I, too, have a fear of aging. I’ve been slathering on anti-wrinkle cream since I was 16. This was a beautiful post. Thank you for sharing your life with us. Yes, Kayle…you kids need to stop doing that! You should still be in pigtails, and 5 years old..
mi chile!! I hear yu! Trying to do it gracefully. Don’t eat meat tho so have to find a substitute. I think it would be eating rose apples off the tree. Wish I could relate to you on the hair. I’ve been going gray since I was 25. It’s just getting more rapid now in my late thirties. I DO know special meatballs, though. Pork meat balls that had rice in them. Don’t think my great gran called them ‘porcupine’. They were served with a sweet and sour sauce. Those are my memory incuding meatballs. I miss her. I miss them and her other version with cocktail weenies and pineapple. She took those recipes with her to the grave. 😦 I still try to play around with recipes trying to recreate it. Oh… and my parents have never been convinced I ever grew up. I keep trying to wave car payment papers and utility bills at them to prove otherwise. Hasn’t worked so far. Yep, there are moments when you think time has passed you by and that suddenly you’re old…damn! Strange how that happens when in your head you’re young and it’s everyone around you who’s getting older. You can’t be old. I am a few days away from 38 and have a slumbering 4-month-old on my shoulder. I chase a preschooler. And I’m not that far behind you. 😉 But, I completely understand what you mean (not about the pre-men part, but my it shoots past at a meteor’s pace). Thank you for sharing this recipe from your childhood. I’ve never had them and look forward to trying them. Is there botox in these meatballs? Great post. And it never changes. You always feel that everyone else is aging around you while you stay the same. I’m 61 now and it’s true. And my mother is 88, and she assures me that it is still true. Thank you for all you do. I nominated you for a couple of awards to show my appreciation. More proof that having kids makes you old. Period. It’s all their fault. It’s a trap we fall into. I was cool until I became a stepfather in my mid-50s. What was I thinking? Suddenly, my tastes were being criticized. We could be walking down the street and a passerby would remark, “Cool shirt,” noting the day’s Hawaiian selection, and one of my kids would insist, “He’s being sarcastic.” Yeah, right. I remember a friend whose preteen son once asked her, “Mommy, can’t you dress more like a mother?” That is, older. Bet she’s still gorgeous. The best solution, as far as I can see, is let the kids deal with it — they can be older, while we just cruise along right where we want. Cool as the proverbial cucumber, if we maintain our attitude. Me, I’m still a retired hippie and sagacious yogi. Let them be envious. By the way, thanks for the porcupines. Takes me back to memories of Grandma and Grandpa. Not a bad place to be for a bit longer, that is, in all those confusing times before I became, well, cool. I am definitely going to try some porcupine balls and am very glad I read this post. The term “porcupine balls” had me really concerned. Thank you! Awesome feedback. I will definitely check out the Ray Bradbury book…he was one of my favorites back when I spent more time reading than writing. Loved the post and what a great idea teaming up with Adam on it. 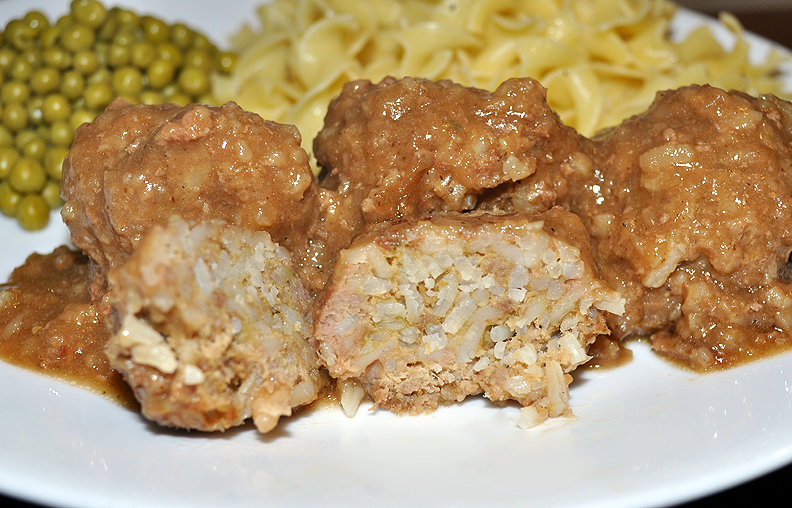 I don’t remember ever having porcupine balls, but my mother did make a meatball recipe similar to it minus the rice. Thanks for sharing it and the story. Thanks, Jason. It was fun teaming up. We are doing salmon patties next. Mrs. G has a killer salmon patty recipe so I let her cook those. Me, I have no clue how to make them. Can’t wait to see what you and Adam come up with. Thanks for liking and following my blog. From what I’ve seen I think I will really enjoy yours. We never called them ‘porcupine balls’ just ‘porcupines’ and the sauce and seasonings are tomato based. Sometimes like Spanish rice, sometimes Italian flavored. Next will be trying these two recipes. Love onion soup! Can’t wait for the salmon patties. I can’t cook much anymore due health but my wife likes to cook. She’s not much for salmon patties but the cats and I out vote her. 🙂 I like your writing too. With your recipes and the good writing it’s like getting dinner and a show. I am also a closet porcupine eater! I have to tell you that Bryce, my son who is autistic, is an extremely picky eater. Cereal makes up 75% of his diet. But he loves porcupine meatballs. Hence, I make them often-just for Bryce! On a side note, you are definitely not old. If you were, I would be old too. A full ten days older than me! But we are not old……. Oh, I loved this post! It reminded me so much of my own situation….how can my kids be growing up so fast but I remain 21? And you’re not old. It’s all relative. The secret of youth is to hang around older people 😉 Both recipes sound delicious. I’m going to make them tomorrow! I’m glad you visited my site! Had you not, I might have gone another day without finding your site! Love the post and can’t wait to try these! Wow. This post. It’s just so true! Holy Amaze-balls!! Those meatballs look glorious. Thanks for making me tear up while reading. The saline softens the lines beneath my eyes. Gosh y’all, you’ve got me feeling nostalgic on my birthday. Think I’ll go buy some hamburger. I made them for dinner tonight, too..
On a happier note, the porcupine balls are something I’ve never had but I think they look delicious! I love moms. 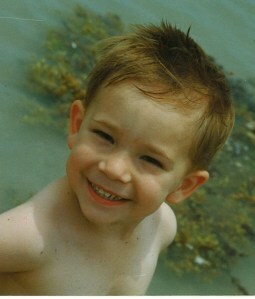 Very cute kid. Hey Jnana, that IS a cool shirt! They are mouth watering recipes. At 50 (I’m phat hen) and 56 (he’s old rooster), we can more than relate to both your stories. Our “baby” is 26 and a Sailor in the USN. Old Rooster learned to cook at his mother’s knee, and I learned mostly from my father. We are salt free so I think I’ll have better luck substituting the salt/sodium ingredients in Adam’s recipe with no salt/sodium chicken or beef broth than the cream soups in yours. I’m not at the point I’m ready to try my hand at homemade cream soups sans sodium, yet…. I learned to can from my mother, so I will eventually. If I have any success, I’ll share with you my modifications. I’m really going to enjoy your site!!!! I can so relate. My oldest son will be 31 in December!! But I still have a 9 year old at home. So when I think about turning 52 this fall, I don’t know what happened. When I babysit my 2 year old granddaughter, I wonder if people know I’m her grandma or do they think I’m her mom?? Unless, of course, her mother, my daughter, is with us and then I think it must be obvious…we’re not sisters (though my husband graciously once said I looked like her sister-a MUCH older one I would add). My grey is hidden, but the wrinkles seem deeper all the time, depending on lighting; I can’t jump out of bed quite as quickly (but then, who wants to? ); and though I can still do front handsprings (REALLY!) like when I was a gymnast many, many years ago, I can’t move for a week afterwards. Aren’t you glad you’re younger than me? On a foodier note, my mom used to make Porcupine Balls when I was a kid, and I liked them. I made them for my older kids, and they liked them. My youngest kids think it’s weird to put rice in meatballs. Maybe because they’re from Australia. Comfort is, after all, in the perception I guess. Oh well. WOW! That is quite a spread you have…a 31 year old and a 9 year old…..you are a tougher chick than me—I don’t think I could do it again…. Oh my goodness! My waist line won’t like it, but I’ve got to make these meatballs now! I suspect since I live at 7,000 feet altitude, I’ll need to increase the cooking time to make sure the rice is done.Thanks. And age is all in the mind–I try so hard not to mind it. Thanks for the great post and for following me. Sister…45 is not old. I wish I was 45 instead of the 48 that I am. My only consolation is that my kids still look like they’re in 5th grade and they are actually high school and college graduates. So that means if I pull my ponytail really tight I can get get away with 39? (Okay…I’ve gotta get some tighter hair ties!) Great post! 😀 Thanks for the laughs! Oh, I am never one to turn away from tight ponies…..and those big comb clips are an instant full face lift. Brilliantly written – had me in stitches. Ill be 41 in a few weeks, my eldest daughter has just finished her Psychology degree and is off to do her Masters – she tells me off for staring at her but it’s exactly like you say – when did it all happen lol! This makes me so sad! I will cherish my time with my little guy. Great post. I will definitely try not to blink these years away. I so could have written this!! I’m surely still 25. 40 is a cruel joke. 😉 And I still see my daughter as a curly headed 3-year old. Thanks for sharing! Hi, I really enjoy your blog and have nominated you for the “Inspiring Blog Award” There are a few rules to this nomination (these aren’t my rules, so do what you want…no pressure) you need to give a shout out to me, of course, tell us 7 things about yourself, true or otherwise, and then nominate 15 bloggers, that’s the tricky part, if you don’t have 15, don’t sweat it, just pass it on to someone….share the joy by following this link, http://my-sweet-addiction.com/2012/08/13/ramblings-about-candy-and-baking-can-be-inspiring-2/ …….and good work! Your writing is just wonderful. BTW, I’m mid 30’s – and I’m gonna stay there! Forever! Not getting email updates from any of the recent blogs I’m following. Might have to unfollow, follow again to activate. Please bear with me. I am going to try your recipe, maybe make one little change because I don’t eat beef. But maybe with veggie crumbles or quinoa it might work. When I saw gravy and rice together, I knew I had to continue reading!! One more thing — even when our children get older, isn’t it still a blessing and a joy to see them happy! And thanks for looking at my blog, I am glad you enjoyed it. I love the Unorthodox Epicure and his post with this recipe was one of my favorites. Your post is also beautifully written! From someone in her 40’s who doesn’t have kids, I still find such warmth and humor in your story – it’s simply my friends who seem to be growing old around me, instead of children. Your story is from the heart and that is what makes it captivating. Thank you for sharing! I always said I would never get plastic surgery…until I needed it! Funny post. I used to make porcupine balls. I’ll have to dig up my recipe. Thanks for stopping my my blog! This getting old topic is a sticky topic… 🙂 Grandkids only remind you of the topic all the more. You are not old, to me you are a hottie. I have kids older than you, and they have kids who are starting college. Old is a state of mind just believe it. Stay thinking you are twenty five, hell I still think I’m twenty-five, my body doesn’t agree, but my mind still does. Thanks for the follow. I look forward to following yours too. I am a storyteller, and I recognize a good one when I see one. You have a long way to go before you need to worry about getting old, but the good news is that a storyteller can only get better with time and seasoning. Very funny post. My oldest is only 12, but she is changing so much! She’s this little mini adult and it’s WEIRD. Also, I don’t feel old – well, not emotionally anyway. I think I’m still 12 in maturity. Ah, well. Oh my gosh, I remember my older sister making porcupine balls except she used tomato sauce instead of brown gravy. I liked them. I’ll have to ask her to make some. The thought occurs to me with the tomato sauce you could actually use them for stuffing green peppers! This post just reminded me . . . I turn 43 in a couple weeks, and I got carded last Thursday! Well, the cashier just asked for my birthdate, but it was like getting carded! But when I got home, there were groceries to put away, and I forgot to tell anyone. That’s a great pair of posts. I love the Asian take you did on yours….I will have to try something similar next time…The family won’t eat curry, but some nice honey soy would be great! You are not old…and I just freaked out when my oldest son in fourth grade asked to start wearing deodorant. He still smells like baby soap and chicken nuggets…”NO you can’t wear deodorant!” I lost my $hit….so reading your post makes me feel better. Thank you. We are not old and they will stay our lil babes forever! Hair or no hair or lots of hair everywhere! Thanks for sharing! That’s about when my youngest son wanted to wear deodorant. Now that he’s in 9th grade, its big drama to get him to wear it, although he needs it desperately.